Bring along baby for this moderate, total-body workout designed to target all your mommy muscles. You’ll use your stroller in a variety of cardio drills, strength exercises, stretching and core work while your little one enjoys the ride and quality time with you! Moms should be at least 6 weeks postpartum (8 weeks for a cesarean section) and have doctor’s verbal approval to resume physical exercise. Workout with your baby! This 45-minute body sculpt class will work all your muscles to help you tone and tighten while bonding with baby. 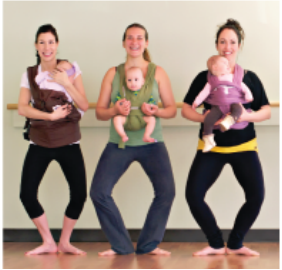 Each class includes light-to-moderate cardio, standing exercises you can do with your baby, as well as floor exercises. Little ones can hangout wherever they are happiest - car seats and carriers welcome, and plush oversize pillows are provided. Perfect for new moms!